December 28, 2013 December 28, 2013 by Beau H.
With smartphones so ubiquitous nowadays, many question the necessity of wearing a watch to begin with. However, in the right setting and in the right style, a watch can function like any other part of an outfit — a finishing touch that sets the tone for an outfit, or a standout accessory in its own right. Building a basic, essential watch collection can be tricky, especially when so many expensive models are out there. And there are certain types of watches that definitely fit in different situations, making things even slightly more confusing. While a great dive watch is exceptionally versatile — wearable with jeans and a t-shirt as well as a suit when styled right — it’s always nice to give your timepieces a break. And, shaking things up on the wrist is as beneficial a style move as rotating shoes or other items of clothing. That’s where a great rubber strap watch can come into play. But not the sporty, digital iterations worn to run races or anything like that. Think of the right rubber-strap watch as another casual watch to wear with simpler outfits, like the Timex Weekender (seen here as part of a Budget Style Guide). The Stuhrling Aquadiver Manta Ray watch. Perfect for soaking up some, uh, rays. That’s why this past Christmas, I was pretty pleased when Santa showed up under the tree with the Stuhrling Aquadiver Manta Ray watch. Now, the title on the Amazon link is quite a mouthful, but within just two days of wearing this timepiece, it’s clear that it’s quite the watch. Yes, the watch is a quartz, meaning the battery will eventually have to be replaced. Although there’s quite the debate about quartz watches versus automatic varieties, the important thing about this timepiece is that it, well, tells time and runs well regardless. Pure function aside, the great thing about this piece is its versatility. It would work in exactly the same scenarios as a Timex Weekender —for example, with an Oxford cloth button-down, sweater and jeans (as paired with on Christmas in cold New Hampshire) or with a polo and shorts (as worn in Florida during part 2 of a vacation trip). The color of the dial is a cool black with white symbols along the outer ring — no outlandish dial or strap here. And because of that rubber strap, there’s a durability aspect that a stainless steel watch doesn’t bring all the time — you needn’t worry about serious scratches or major damage all the time with this watch. Additionally, because the rubber strap is more casual than even a stainless steel strap, you don’t have to worry about matching the strap color with your belt all the time (honestly! Look closely here for an example). The Stuhrling watch in action. Note the contrast on the bezel. The watch’s bezel actually works, as it rotates. The contrast between the numbering on that outer ring (as seen below) is a nice visual touch, as well. The stainless steel case is 42 millimeters in diameter, and it wears about that size — not overwhelmingly large, but slightly bigger than the average watch. 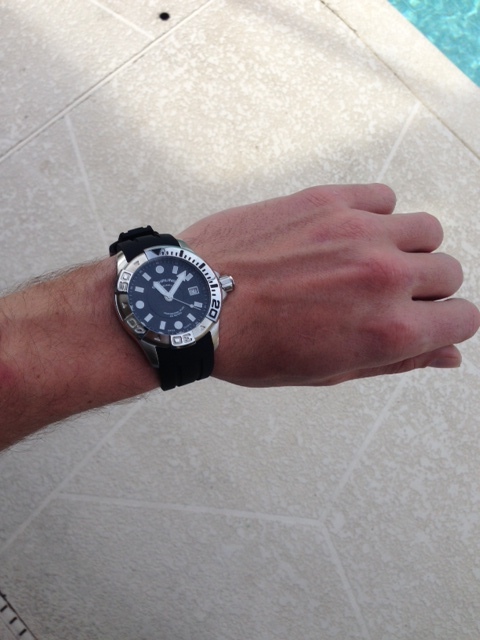 It’s waterproof to 300 meters, making it very suitable for actual diving, and the watch feels sturdy overall. The screw down crown feels durable, too. The area where the rubber straps attach to the watch case itself also feels sturdy — there’s a reinforcement aspect to those pressure points that’s reassuring if this watch is going to see some serious work. Most importantly, this watch (at least according to its Amazon page) is a serious, serious bargain when bought at the right time. It really embodies what great style should be about — it’s versatile, durable, well-built and extremely affordable. Not a bad job by Santa this year, in short. If you’ve had any experience with Stuhrling watches in the past, leave it in the comments!